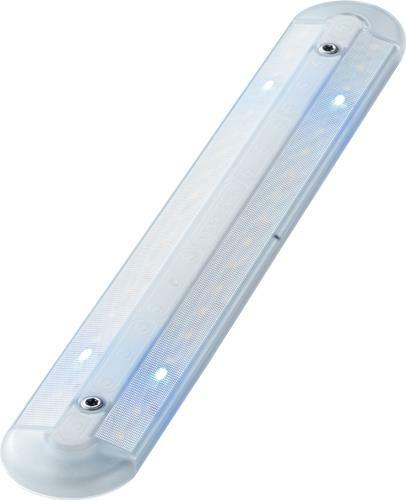 The F-22 HO is an extremely low profile touch activated linear LED fixture featuring dual color operation. Waterproof construction can be immersed in up to 1 meter of water. The F-22 is very easy to install: completely surface-mounted, only requiring two screws for fastening. Turning the fixture on and off and/or switching from warm white to red LED is achieved via photo sensors which respond to finger touch. Warm White/Red, Warm White/Blue, Cool White/Red and Cool White/Blue LED Bi-color bulbs available. Bi-color, or "Dual," LED bulbs option a full-brightness Warm or Cool White LED as well as a secondary Red or Blue LED.